The U.S. Consumer Product Safety Commission (CPSC) is urging parents of young children to anchor and stabilize their televisions, furniture, and appliances to prevent tip-over related incidents. In a quest to reach a toy, TV or game remote, or other desired item, young children are using dressers and tables as climbing devices and the results are tragic. 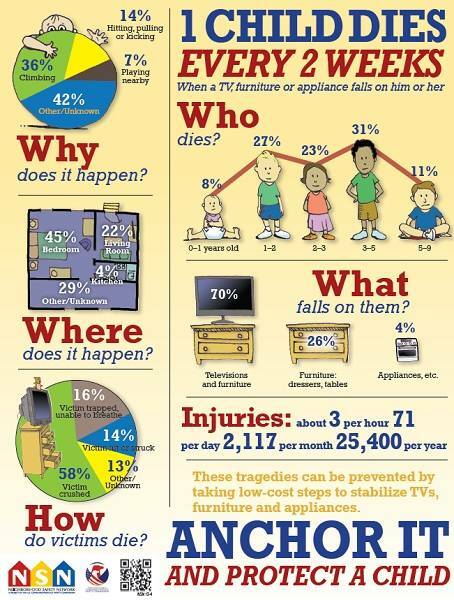 A new CPSC data report shows that 349 consumers (84 percent of them were children younger than age 9) were killed between 2000 and 2011, when TVs, furniture or appliances toppled over onto them. 2011 had the highest one-year number of fatalities reported. The 41 recorded fatalities is an increase from 31 in 2010 and 27 in 2009. This total also may increase in future years as additional fatalities are reported. "We know that low-cost anchoring devices are effective in preventing tip-over incidents," said CPSC Chairman Inez Tenenbaum. "I urge parents to anchor their TVs, furniture and appliances and protect their children. It takes just a few minutes to do and it can save lives." Small children are no match for a falling dresser, wall unit or 50- to 100-pound television. Children involved in these tip-over incidents often sustain severe head and other injuries to the body as a result of being crushed by the product or trapped under its weight. In 57 percent of the reported fatalities and 39 percent of injuries, the victim was struck in the head by the falling item. Unanchored televisions placed on dressers, bureaus and tables not intended to be used as a TV stand have been associated with many tip-over incidents involving both the TV and the furniture. Flat screen and older, bulkier cathode ray tube (CRT) televisions should be placed on stands appropriate for the size and weight of the product. Once in place, an anti-tip or stabilizing device should be installed to help prevent tip overs.